Coast Guard Flag Display Display Case Shadow Box - Great military gift. Our NEW Coast Guard Flag Display Display Case Shadow Box for the U.S. Flag is hand-crafted out of solid walnut that has a high-gloss finish with a lightweight acrylic front panel. This premium, well-crafted Coast Guard Flag Display case with shadow box is designed with timeless elegance and solidly built to maintain its classic appeal and withstand years on display. 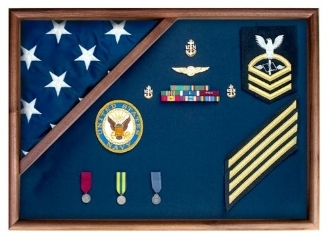 This beautiful Coast Guard Flag Display is perfect for displaying your special 3-ft x 5-ft flag and any other memorabilia, such as medals, rank insignia, patches, pins and more.